From Iron Hill to Delco with Love . . .
dedication to community and the art of brewing. D.L. Isn’t Wilbert Montgomery the guy who rushed for 194 yards in the 1984 NFC Championship game against the Dallas Cowboys? B.B. Yeah. He’s my favorite because he understands that to play in the big leagues, it’s all about hard work and attention to detail. And one day, I saw him quoted in a newspaper when he was the running back coach for Cleveland and it blew me away. D.L. Why? What did he say? B.B. It went something like this… Each day you’ve got to be ready to go. You have to play sore and banged up. And if you don’t, you really can’t play. D.L. So Montgomery didn’t romanticize what’s it’s like to play in the NFL? B.B. Nope, but that doesn’t mean it’s not cool or worthwhile. It’s like being a brewer. Every step in the process is critical. There are no shortcuts. You don’t stop and eat lunch when it’s time to check the wort. D.L. Since you grew up in Glenolden, have you reconnected with old friends? What do they think about your awards? B.B. Once in a while, a guy that I haven’t seen in 15 years will walk through the door and order a Delco Lager. So the answer is yes. 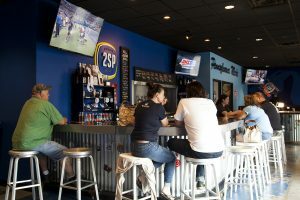 Our taproom is like a neighborhood bar, a place where locals can hang. They can even bring their own food – as long as they are willing to share. Hopefully, they’ll come back because they like the beer, not because of the medals. D.L. So what was it like to win your 31st medal – a gold for your Russian Imperial Stout, at the Great American Beer Festival this past October? B.B. Oh, it was nice. I’d like to keep it with the other 30 medals, but I don’t remember where I put them. D.L. You don’t know where your medals are? B.B. They’re somewhere in my basement. That much I know. For me, hearing somebody say ‘Mmmm’ after taking a swig of a beer I made with my own hands is the best award going. D.L. The GABF judges said ‘The Russian’ is a text book example of what an Imperial stout should be. Does that mean you have the best recipe? B.B. That’s part of it. Brewers are like a bunch of competitive siblings trying to make their Nana’s meatballs. Each one swears they are following her recipe, but the meatballs all taste different. D.L. You beat out 90 other Imperial stouts. Why do you think The Russian won gold? B.B. The challenge and the fun of brewing beer, at least for me, is the attention to detail it requires every day, every step of the way. 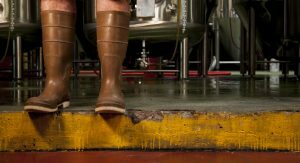 When you pay attention to all those details, they add up to a fully developed and articulated beer – one that has the right flavor, body and balance. Hopefully, the judges found those things in my beer. D.L. So what does it taste like? And what is the difference between The Russian & its little brother, Baby Bob Stout? B.B. I’ll answer that in a second, but don’t you want to ask me about Antonym? D.L. Of course… Andrew “Ruby” Rubenstein, your co-worker at 2SP and Iron Hill, won a bronze at the GABF for Antonym. What kind of beer is it? B.B. It’s a Grisette [a light, refreshing beer like a Belgian farmhouse ale] made with some Nelson rye for a touch of spice. Antonym reminds some people of a Sauvignon Blanc wine, but I like to describe it as a dry-ish ale with a touch of sweetness in the finish. Amazing. I’m so glad he got recognized for it. D.L. Ruby’s title is Head Cellarman. Is that different than being a brewer? B.B. It’s just a different approach to brewing. Ruby is the driving force behind our more experimental beers and barrel-aging program. He brews stuff that he envisions in his head and I’m more by-the-book so in that regard we are total opposites. Then he’s from Pittsburgh, so there’s that whole Steelers vs. Eagles thing. But neither of us likes to talk much, so we work well together. D.L. Getting back to the other question, The Russian vs. Baby Bob Stout? B.B. The Russian is big [ABV 9.5%], roasty and chocolatey and has a hoppy backbone. It’s smooth and balanced so you want to down a few of them… Baby Bob is actually an American stout although we think of it as The Russian’s little brother. It’s got caramel and chocolate flavors with a nice dryness in the back from American hops. It’s not a malty stout like Guinness. D.L. 2SP is famous for a Russian Imperial stout, an American-style stout and a Grisette ale. Yet the first beer you made is Delco Lager? B.B. Yeah, my partners had the same reaction. There’s no place to hide any mistakes and I wanted to make Delco Lager to challenge myself. Besides, my buddies and I grew up drinking lagers and I wanted to make a beer that my neighbors could relate to. I wanted to make a tasty party beer. It’s only got 4% alcohol. D.L. 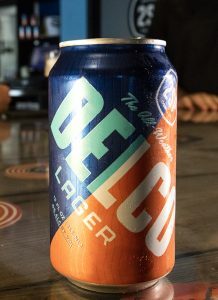 Delco Lager has a lot of flavor despite its low alcohol. How do you do that? B.B. I use European malts for their raisin-y, roasty flavors, which I love. To me, it makes beer comfort food in a glass. D.L. You’ve made 40 different beers this year. What’s left on your brewing bucket list? B.B. I’ve worked with Philly’s Green Street Coffee Roasters before so I’d like to make a coffee Russian Imperial stout using their beans. And I want to do more collaborations, Coppertail and Hardywood would be fun, and sours are on the list too. D.L. What’s the best thing about having your own brewery? B.B. For me, it’s getting our ASAP IPA out the door so locals get to experience its Citra and Centennial hops at their peak of freshness. It’s only got 4.2% alcohol so it’s completely crushable. D.L. 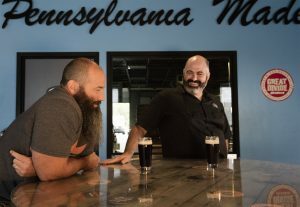 What’s a big misconception about having your own brewery? B.B. My friends think I drink for the fun of it all day. I really just taste all day because my mouth is the quality control lab. We can’t afford fancy equipment. And nothing here is automated, so all the ingredients get dumped into the vat by hand. D.L. Do you have any holiday traditions you’d like to share? B.B. I love watching Home Alone with my kids. Macaulay Culkin cracks me up and it’s a good excuse to open a Sierra Nevada Celebration. I look forward to that beer all year long. D.L. Anything else you would like to share?